L-R Esaie Jean-Simon, Nigeria Ealey, Victor James pictured at the Artreprenuer Fest. Tier NYC is a clothing brand inspired by intense art and modern day style created by Nigeria Ealey, Victor James and Esaie Jean-Simon more than 4 years ago. 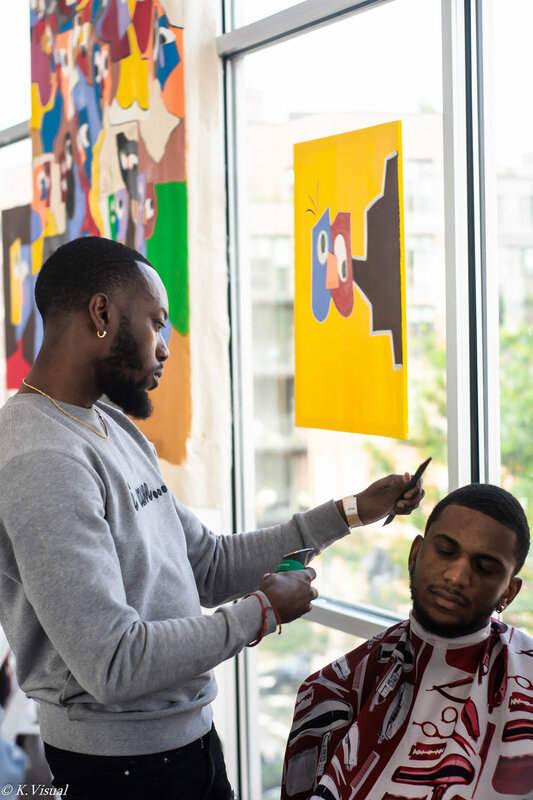 Having plenty experience as entrepreneurs and leaders of the culture, these three gentleman put together The Artrepreneur Fest to support young black creatives and "recognize rising entrepreneurship". Creatives let their best work speak for themselves at the W Loft in Brooklyn, New York. The Artrepreuneur Fest celebrated creatives involved in the art of music, cuisine, spoken word, photography, beauty and even lighting. Ariel of Entrees by Ari, Hezekiah of ChefnTailor and Tashea Channell of Honcho's Food Diary kept our mouths full of delicious appetizers that made it easier to enjoy the open bar. Snow the Barber was ready to freshen up a few hairlines and Arnell's Hair Collection had bundles of Brazilian extensions available for purchase. One of the many goals of us creatives is to make a living off of our work. TIER NYC generously provided a panel discussion featuring 6 entrepreneurs hosted by Sirius XM's Swaggie Sie to share their experience owning a business. Tier NYC's signature 3 slash logo has been seen on celebs like Big Sean, and Desiigner and as leaders of street style, it was only fitting for the brand to drop new merch! Tier NYC partnered with painter Pierre Jean-Baptiste to create two exclusive limited edition t-shirts and tote bag for the launch of their first annual Artreprenuer Fest. Featured artists were 3rd Eye View, Delasnp, Pierre Jean-Baptiste, Claude Celestia and Rachel Fritsch along with over 13 more musical performances. Musical guests included Jus Beatz, Sixteen, and Preach Gold, whose single "Summertime Villain" is currently on 3-peat in my headphones. One memorable performance in particular was brought to us by Cito Blanko, a spoken word artist from the Bronx, NY. He walked onstage and it didn't take long to keep all eyes on him as he recited a piece titled "My Pain, My Gain". Check out the clip below. (For full poem transcript, click here). Overall the most enjoyable part of the Artrepreneur experience were it's guests. People were full of great conversation. I spoke with folks about everything from music to fashion and some even shared a few short term goals with me. It was obvious that The Artreprenuer Fest triggered a few minds to start their own entrepreneurial journeys. Congratulations to the entire Tier NYC team on a successful event! I look forward to next year! To keep up with new merch and brand updates, follow Tier NYC here. Cariuma Brings Rio Vibes to NYC!